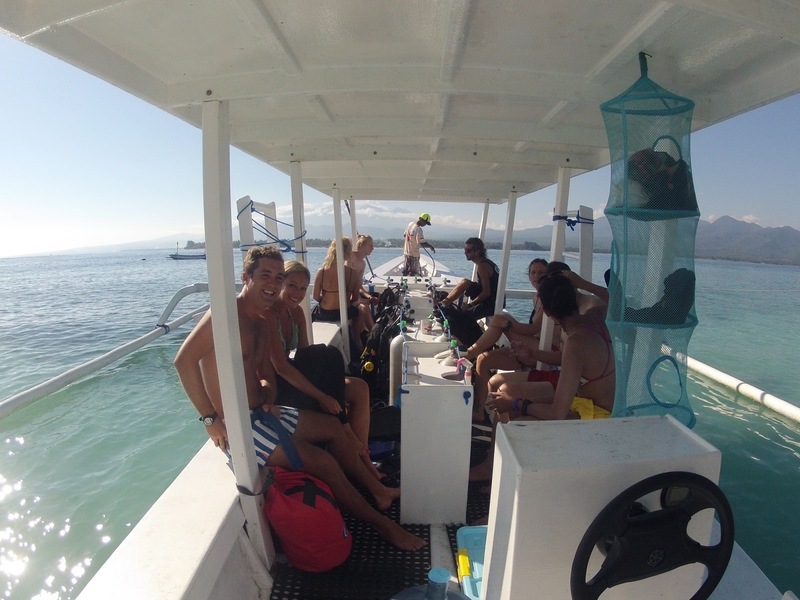 After a great stay on Gili T we decided to hop over to Gili Air (smaller than Gili T but bigger than Gili Meno) to do a 2 day freediving course with Gili Air Divers. 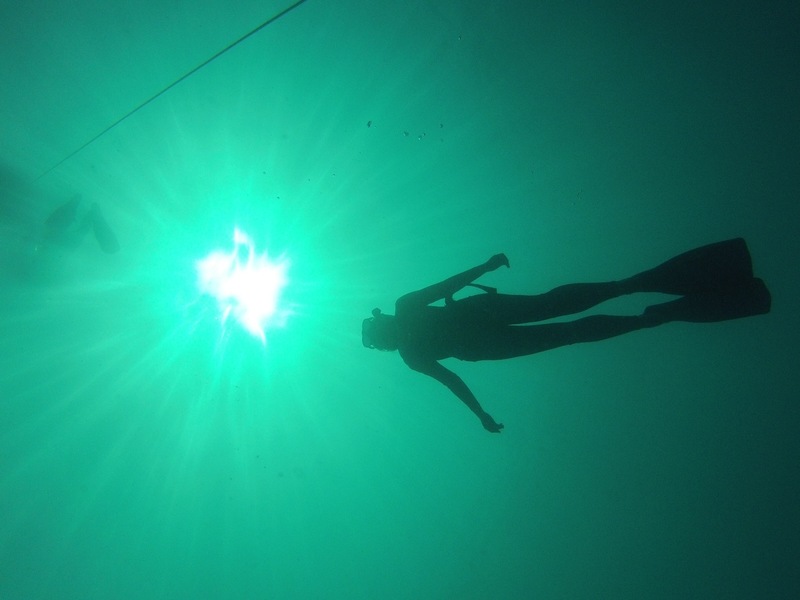 We chatted to a freediving instructor on Gili T and were excited by the idea of being able to dive down to 10-20 metres after just a couple of days training. We chose Gili Air divers over the school on Gili T as they were much more flexible about dates and also gave us a personalised course, just the two of us to one instructor. 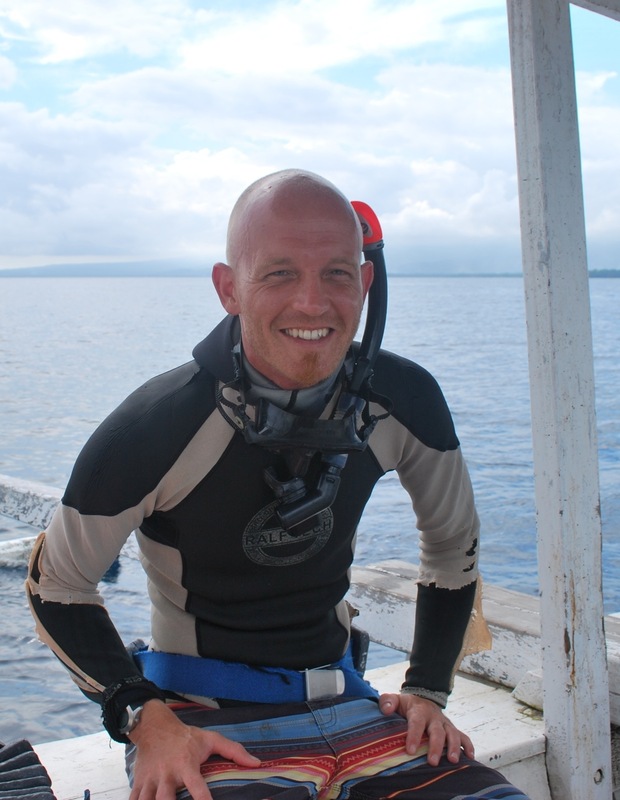 On the first day we met our instructor, Andreas, and got kitted up with a wetsuit, fins, snorkel and mask. After signing our lives away we started off with some breathing and relaxation exercises, a bit like a guided meditation. The purpose of this was to get us really relaxed, with a lowered heart rate, before we went in to the pool to do some breath holding exercises. We had both been practicing holding our breath underwater and I just about managed a minute while Jack did over two! I managed to more than double that with a breath hold of 2 minutes 15 seconds in the pool while Jack did 2 minutes 30. We then practised finning in the water to make sure we were moving efficiently whilst holding our breath and swimming laps. After this we went out on the boat to have a go in the ocean. We set up in an area with a 20 metre depth and Andreas dropped down a weighted line from a buoy with a tennis ball marking the 10 metre level. 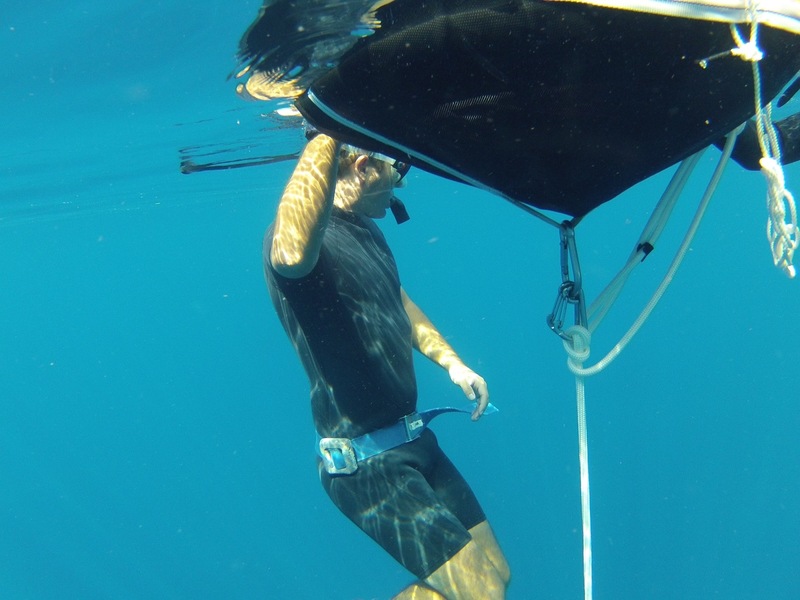 10 metres is the assessment level for a Level 1 Freediver, eventually we would have to complete a number of tasks at this level to pass the certification. We started off with the breath-up. This is always the first process in a freedive and consists of you wearing a mask and snorkel and immersing your face in the water while breathing slowly deeply and calmly. Interestingly all mammals have a dive reflex which is triggered by immersing your face in cold water. This reflex lowers your heart rate between 10-50% and conserves oxygen and energy levels by focusing blood flow to the vital organs, restricting flow to the extremities – clever! Once we had spent around two minutes relaxing and lowering our heart rates Andreas gave us the OK sign underwater. 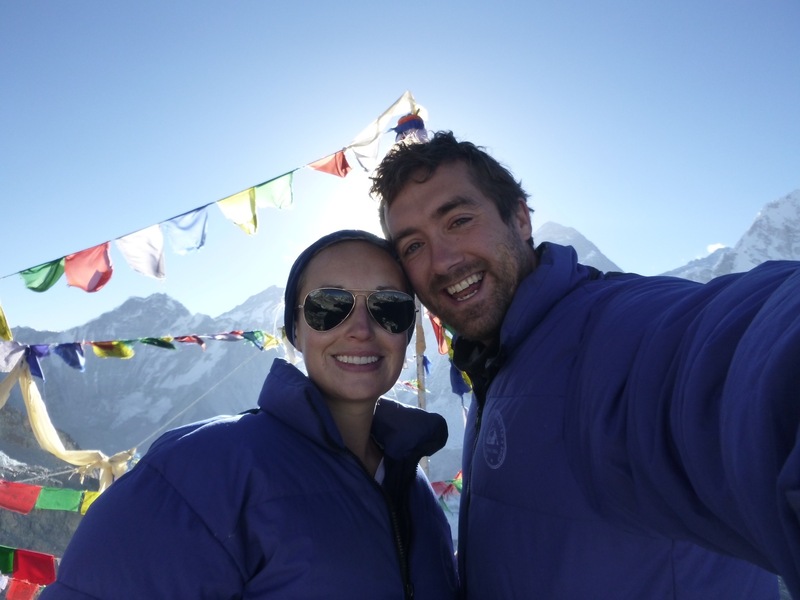 This meant it was time to take our last three breaths – these breaths are very important. You breathe in against your tongue sharply to pack oxygen in to your lungs and you try to send the air into your belly and the bottom of your lungs first and then fill up to the top, the exhale should be up to twice as long as the inhale. On the third of these last breaths we had to remove our snorkel from our mouths, re-pressurise our ears and start to climb down the rope towards the tennis ball marking 10 metres. The biggest battle with freediving (and apologies for sounding like a wanker here) is with yourself. Despite knowing that in the pool you can hold your breath for 2 minutes or more, when you’re 5 metres down after 30 seconds your natural urge is to swim back up and gasp for air! Anyway, Andreas is literally the most chilled man ever and he really helped us to relax and feel comfortable climbing down the rope. Eventually we had both reached 14-16 metres and were quite comfortable bobbing around at the bottom of the rope, climbing back to the surface slowly without freaking out. A succesful first day! Day two was cut short as on Jack’s first dive down he burst a blood vessel in his sinuses and had a nose bleed. If he had continued we would have been asking for trouble, and luckily Andreas was really flexible about us just coming back the next day to try again. We used the afternoon to take our theory test (yep, we had to really learn stuff!) which we both passed – phew! Day three began with breathing exercises and some yoga before we hopped on a boat with some scuba divers to have another go and hopefully pass our assessment. Andreas set up the buoy and dropped the line again with the tennis ball marking 10 metres. Jack dived down as a test and luckily didn’t have any sinus issues so we could go ahead with the assessment. This time we learnt how to do a proper duck dive and fin down to 10 metres rather than climbing down the rope. Essentially you get deeper much faster, but it is easy to have a rubbish technique and lose lots of energy and oxygen fast as I discovered! After quite a few attempts I got the hang of it and started to feel more relaxed and less oxygen deprived under water. Jack took to it like a duck to water (sorry) as usual. Then came the assessment. The first test was stopping at the 10 metre mark, turning around and then swimming back up using just your arms – this is to make sure you are safe if you lose a fin. We both managed this with no problems. The next test was to stop at 10 metres and remove your mask, swimming up without it. This one was an issue for me as I bloody hate water going up my nose. I managed it BUT I freaked out and instead of coming up calmly I finned like hell, blew air out of my nose and nearly hyperventilated at the top! The final one involved our instructor Andreas playing dead at 10 metres and us rescuing him, swimming him up to the top and performing basic first aid at the surface. We both managed it and hooray we had passed! 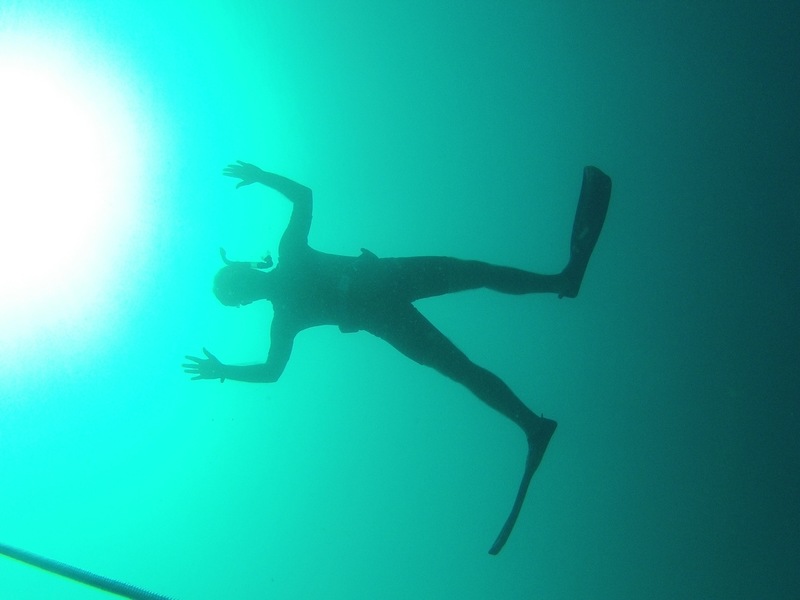 Overall the freediving course is great fun and teaches you so many new skills from relaxation, breathing techniques and yoga to the diving itself. For anybody considering it, we would highly recommend Andreas at Gli Air Divers – he is the calmest man ever and you always feel like you’re in safe hands, even 10 metres underwater!